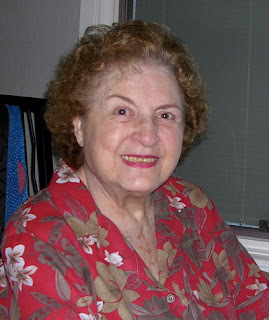 I'll be a bit light on posting for a few days; my dear mom just died this afternoon. Sincerest condolences from an avid reader in Australia. I just discovered your blog--and love it. Clutter-ectomies are a topic dear to my heart. I am *so* sorry to hear about your mom! My thoughts are with you during this tough and painful time. Oh Jeri, I'm so sorry. My heartfelt sympathies during this difficult time. You and your family will be in my prayers. The picture you posted of your mother is lovely. I know she must have been very proud of you and your fine work. Thank you so much for your notes. It means a lot to me. I'm so sorry - what a beautiful woman. My condolences and prayers go out to you. Thank you - your thoughts and prayers are most appreciated. I check out your blog regularly and just wanted you to know that you were in my thoughts. Hang in there. Thank you - and I'm back to blogging now. Sorry to hear about your beautiful mom. I am so sorry to hear of your mother's passing. I hope you are okay and know that your mother is in a peaceful place. The photo you posted is lovely. Thank you, GraceAnn. I'm OK, although of course I miss her very much. What Do You Do with a Broken iPod?